For The Mother of Us All, I am honored to work with Kane Mathis. 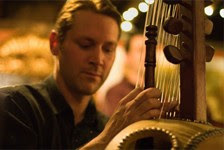 Kane is a multi-instrumentalist specializing in plucked string instruments such as the oud and kora. These instruments are akin to the guitar and harp. For Spectrum Dance Theater's new production playing at The Moore Theatre from March 3-5, I invited him to participate. After our initial meeting in early November 2010, I knew that he would be perfect for this project. Here's a sample of his music. that musical traditions powerfully connect to folks when used in everyday life. As a musician raised in Chicago, Kane also realized in his 10+ years of studying with Malamini Jobarteh and Moriba Kouyate, that he wasn't from a lineage of kora musicians; that even though he would have the opportunity to perform for audiences throughout The Gambia on national television and radio as well as earn him recognition by the Gambian president, he would need to incorporate his musical background as a classical, jazz and indie rock musician with his present life. Kane moved to Seattle over five years ago to follow another teacher, Münir Nurttin Beken from Instanbul. Beken founded the State Turkish Music Ensemble, composes for orchestras and film and is known as an oud virtuoso. As a kora and oud musician, Kane currently calls Seattle home. He performs with a half dozen local bands. Additionally, he performs as a soloist as well as with choreographers such as Catherine Cabeen, as composer and musician most notably for the upcoming performance Into the Void to premiere at On the Boards in late April. I first heard Kane at a 4Culture Touring Arts Roster showcase three years ago. Little did I realize that I would have the opportunity to work on a show about Africa and that I would be blessed to work with him.